LIFAN® Pro Series 8,500W 15 hp Generator provides portable power when you need it most! You never know when mother nature might make you a victim. Be prepared with this LIFAN® Pro Series 8,500W 15 hp Generator. A major 8,500 watts of peak power keep the essentials running while you and your family ride out the storm. 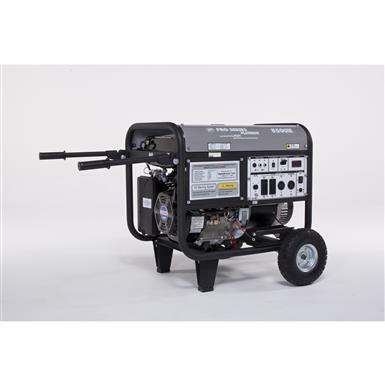 Its powerful 15hp engine has a massive 6.5-gallon fuel tank, good for up to 8 hours of operation. Plus, it comes with never-go-flat tires, so you can take it anywhere without worry. Measures 23 x 23 x 30"h.
Please Note: This item is shipped by commercial carrier curbside. This product Ships in 1 Box, Measures 30"l. x 23"w. x 22 1/2"h., and Weighs approx. 215 lbs. No expedited delivery. High-value orders require a physical street address, otherwise insurance costs will be added to the shipping total. Gas and diesel-powered items, once gassed or oiled, cannot be returned. The manufacturer will require the customer to visit a qualified service center for inspection.